When 21 million tons of ice sloughed off the Kolka glacier in the Russian Caucasus and rode a wave of mud and rocks through the Genaldon valley in 2002, it killed 140 people and buried an entire village. In centuries past, people might have shaken their heads and called this kind of disaster an unpreventable “act of God.” But now many scientists are asking why it happened and whether we can predict similar cataclysmic events in the future. Their work indicates that Alpine permafrost deposits–-like icy buttresses for these rocky towers–are rapidly thawing and increasing the threat of avalanche. The U.N.’s International Panel on Climate Change cited this research when they noted that as global atmospheric temperatures have risen and frozen ground has thawed, avalanches have become more frequent. As these trends seem unlikely to reverse, and will more probably intensify, geologists are scrambling to map and measure permafrost as a way to locate high-risk areas. “Climate change makes mountains instable, at least some of them,” says Stephen Gruber, a geologist at the University of Zurich in Switzerland and a contributor to the IPCC report. He conducts his research thousands of feet above sea level in the Swiss Alps, drilling into ice and rock to take the mountain’s temperature. The term “permafrost” defines any material frozen for over two years. But the particular permafrost Gruber studies first froze thousands of years ago between the jagged gaps and cracks of the Alpine rock face. “Where permafrost is thawing now is where it has not thawed since prehistory,” he says. To understand the structure of rocky mountain tops, Gruber says, think of two stacked bricks. Laying flat against each other, they are very stable, but as you change the angle of the bottom one they become less secure and the top brick teeters. In many sections of the Alps, where large chunks of rock are stacked at acute angles, ice and permafrost act as glue between them. In 2001, Gruber began measuring permafrost temperatures at 20 locations in the Alps. In the summer of 2003, one of those locations happened to experience an abnormally high number of rockslides. 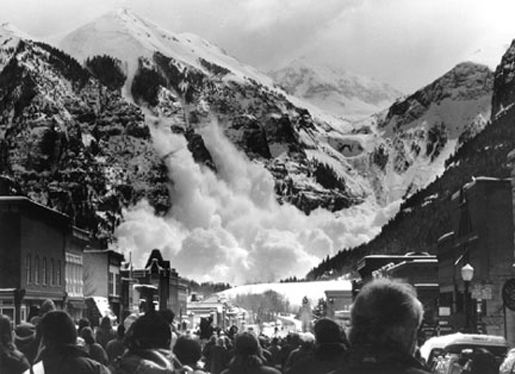 Rock avalanches often occur after earthquakes, or heavy precipitation–when water pressure on the mountain is very high. But neither happened in 2003. “The only thing very special in that summer is there were high temperatures,” and the permafrost thawed more than ever before, says Gruber. Permafrost doesn’t have to completely melt for surrounding rock to destabilize. Because the interfacing rock and permafrost lose friction as they warm, ice at twenty degrees Fahrenheit is doing a much better job at holding the slope together than ice at thirty degrees Fahrenheit. As soon as temperatures get high enough, water seeps from the permafrost and begins to erode the very architecture of the mountain, invading the crevices of the rock face, seeping into cracks and breaking them. Along clefts of a mountain, this thawing occurs much faster and with greater damage to the structure. These are the conditions on Alpine peaks; but there are other slopes where permafrost is not only an adherent for teetering boulders, but makes up a continuous material, carpeting the mountain. Thawing becomes just as dangerous in this scenario. In the Mackenzie Valley, where the Rockies extend into the Northwest Territories of Canada, Réjean Couture a geologist at Natural Resources Canada, studies “active layer detachments” – when sheets of permafrost dislodge and tumble down the slope. The temperature of the “active”, most external layer of permafrost fluctuates more drastically with the seasons than the deeply frozen permafrost core beneath it. It partially thaws during the summer, then freezes again with winter. The top layer also holds the most water, and the thicker it gets (the more extensive the melting), the more pressure is put on the system, says Couture. When this layer gets thick enough, it can break free. The IPCC report claims that permafrost has warmed by at least 5.4 degrees Fahrenheit in some parts of the Mackenzie Valley since 1990. “You might say that is not a significant change, but in fact there is something going on,” says Sharon Smith, a geologist at Natural Resources Canada who helped record these temperatures. However, Smith hesitantly implicates climate change in this trend. “What you attribute it to is a little bit tricky,” she says. Regardless of blame, there’s one way that a warmer climate could increase the frequency of active layer detachments, says Couture. After forest fires obliterate the accumulation of leaves and twigs on the permafrost surface “the insulation effect of the vegetation carpet disappears” says Couture. This allows the sun to penetrate the active layer and thicken it. Given the relative certainty that our planet will continue heating up, there seems to be more pay-off in predicting landslides than trying to prevent them. Both Gruber and Couture say that by measuring permafrost’s location, depth and temperature, they will one day be able to do this. “Through our investigation and this landslide susceptibility mapping, we hope we can help the local government, or the industries working in this area…to understand landslide hazard,” says Couture. His work is particularly relevant for companies planning to build a pipeline through northern Canada. For Gruber’s side of the globe, expanding our knowledge of permafrost could mean, that the next time boulders and ice rain from the Alpine sky, no one will be there to see it. weather layer is make a landslide,rockfall and etc. Has anyone figured out when Switzerland will dissapear?How about when ,”approximately when will we run out of oxygen? Land? Where will we go? etc……….